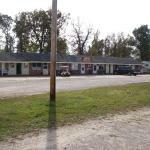 Set in Gainesville Ozark Plaza Motel offers accommodation with a garden. This motel offers a 24-hour front desk. Both free WiFi and private parking are available on site. The rooms in the motel are equipped with a flat-screen TV with satellite channels. The private bathroom is fitted with a bath. Guest rooms will provide guests with a microwave.